As of 8 a.m. there were about 30 Air Canada cancellations in place, most in Toronto and Montreal. The airline issued a travel alert Friday morning, warning of cancellations and delays of its flights across the country. The company is waiving fees for customers who want to change flights. 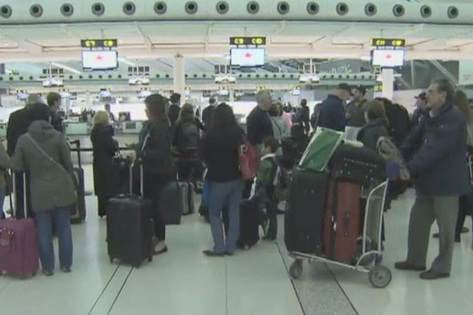 An unusually high number of Air Canada pilots called in sick on March 18, affecting some service at Pearson. On Thursday a source told CityNews that a group of pilots planned to book off sick in protest Friday in Toronto, Montreal and Vancouver in an action unsanctioned by the Air Canada Pilots' Association. Labour relations at the airline have worsened since the federal government passed back-to-work legislation on March 14 for about 3,000 Air Canada pilots and about 8,600 ground workers, including baggage handlers and mechanics. Negotiations between the workers’ unions and the airline have been forced into arbitration. Air Canada pilots claim the government’s intervention violates their Charter rights and they’ve filed a constitutional challenge in Ontario court. The airline’s ground crews staged a wildcat strike on March 22 after three workers were suspended for allegedly heckling federal Labour Minister Lisa Raitt. Air Canada issued a cease-and-desist order about 12 hours after the illegal labour action began. "The lines of communication remain open with the unions ... our hope is that we'll get these issues behind us as soon as possible because we realize it's important to customers to have certainty when they travel," Fitzpatrick said. "The majority of Air Canada employees are working hard to get people to where they want to go." People think they own time. They have watches and clocks and digital pulses. But they are wrong. Time owns them. Travellers are advised to check their flight status before heading out to the airport. Call or check online to confirm. Make it a habit. Thanks Martina for your concern.